Q. Do I have to rent a gown and hood or can I purchase my own? A. All Cambridge robes are available to purchase on-line and in store and are usually available from stock. Click here to go to our Academic Robes sales page. Q. I’m graduating soon, how do I know which gown and hood I need to rent? A. Simply answer all the questions on our on-line rental booking form and we will ensure you are wearing the correct robes on your graduation day. Q. I need a Cambridge PhD gown, do I choose fixed or detachable facings? A. If you are employed by or study at the University of Cambridge, we would recommend detachable facings as there are very few occasions when it is appropriate to wear ‘scarlet’. If the gown is to be worn primarily at another university or overseas then you may prefer fixed facings. Q. Do you deliver robe rentals? A. No. All rentals are to be collected from our store. Q. Your website is closed for on-line booking, what should I do? A. Call our store on (01223) 350371 as there may still be limited availability on certain days. Q. Do I need to bring anything when I collect my robe rental? A. A copy of your email booking, printed or on your smartphone, is helpful but not essential. Q. When can I collect my robes? A. You will be sent a confirmation email once the booking has been processed which will inform you when your robe will be available for collection. If you have not received a confirmation email within 48 hours of placing your order, please call our store on (01223) 350371. Q. When do I need to return my rental? A. Your confirmation email will also inform you when your robe needs to be returned to the store. Q. What if I need to cancel my robe rental booking? A. Should your graduation be deferred we will honour your original booking at a later date with no additional charge, no refunds are given for robe hire cancellations made by the customer. Q. I’ve already booked my robes but just found out that I won’t be graduating until next year, can I transfer my booking? A.Yes, pop into the store or call us on (01223) 350371 and we will happily transfer your booking to a later date. Q. Why are the Alumni tie and scarf restricted products? A. The Alumni ties and scarves have been designed and produced by Ryder & Amies in collaboration with the University of Cambridge. 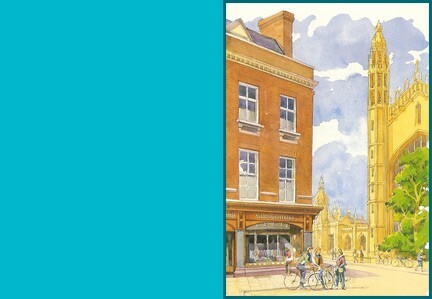 The University of Cambridge have taken the decision to make this product exclusively available to Cambridge Alumni to maintain its significance. A percentage of each tie sold is returned to the University for further investment. Q. How much do you charge for postage & packing? A. Our delivery charges can be found here. These charges vary depending on where your goods are being sent and the value of your order. Q. When will I receive my goods? A. UK orders usually take 3-5 working days, if in stock. We will notify you by email if your product is not in stock and inform you of expected delivery timescale. For international orders please allow 10-15 days. Q. How are goods sent overseas? A. Overseas orders are sent using Royal Mail “International Signed For”, “Airsure” or by Parcelforce “Global Priority” and will require a signature on delivery; should nobody be available to sign the delivery agent will leave a card advising of how to receive your delivery. Q. Can I collect my goods from your store? A. Yes. We offer a Collect from Store service absolutely free. At the checkout under delivery, simply choose Collect from Store and continue the checkout process. Once the checkout process has been completed, you will receive an Order Confirmation email. When your order has been processed and is ready for collection, we will send you a second email. We strive to have all Collect From Store orders ready for collection within 24 hours, however, this is subject to stock availability and cannot be guaranteed. Q. What are the rules about VAT and International Tax Free Orders? A. UK Value Added Tax (VAT) is applied to all prices on the website as standard apart from books and children’s clothing, which are exempt. If you have a non-EU/International website account the prices are shown without UK tax. If the delivery address is outside the EU, the UK tax will be removed at checkout.